The 10 Best French Fries in Nebraska! French fries, in all their forms, have a special place in the hearts of Nebraskans—and that place is usually right next to a delicious hamburger. Whether you opt for classic cut fries or special truffle oil fries, there are plenty of places to get your French fry fix right here in Nebraska. To help you navigate the endless options, we’ve compiled the 10 best places for delicious French fries in Nebraska. Which one is your favorite? Block 16 in Omaha is the place to go for a seriously creative menu of specialty French fry options. Order the dragon fries which come covered in cheese curds, scallions, and a crushed fortune cookie. Or, the poutine fries, which are topped with cheese then smothered in beef gravy. At Angus Burgers and Shakes in Kearney, you can choose to have your skinny fries or masa waffle fries truffled or covered in chili cheese. Both options are highly recommended by the locals. The Eatery in Lincoln is timeless diner that makes the list for their excellent home-style cooking—and fries! The Eatery fries are made to order and always worth ordering! The Coney Island Lunch Room is a simple, old school diner in Grand Island that has been mastering the hamburger, milkshake and fries combo for decades. The fresh, homemade French fries always come out fresh, hot and crispy!The Eatery in Lincoln is timeless diner that makes the list for their excellent home-style cooking—and fries! The Eatery fries are made to order and always worth ordering! At Plank Seafood & Provisions in Omaha the chowder fries are a must-try. Smothered in Applewood smoked bacon, clams, and scallions, these fries pair perfectly with everything on the menu at this seafood joint. 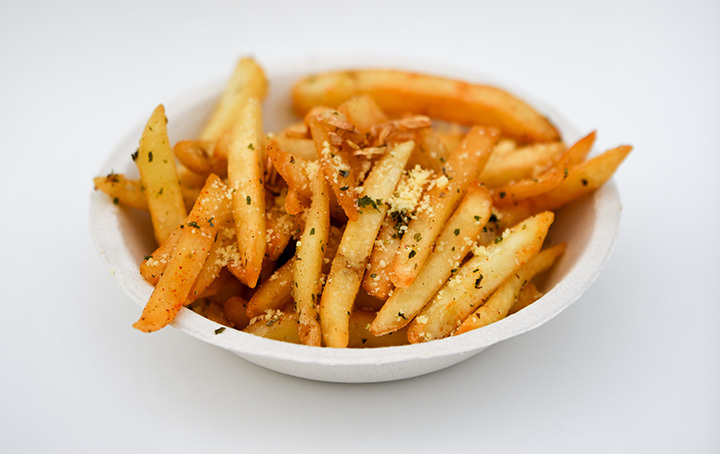 If you visit Honest Abe’s Burgers and Freedom in Lincoln, be sure to order the parmesan truffle fries which are perfectly crispy on the outside, fluffy on the inside, and drizzled with tasty truffle oil and fresh parmesan cheese. If you’re not feeling like a hamburger, just order the fries! You won’t be disappointed. Wilson & Washburn in Omaha is serious about its fries. A go-to for fries made in house, you’ll understand why everyone raves about these fries the moment you bite into one. Mac’s Drive-In is an old-school drive-through restaurant in McCook that has been around for ages, but their fries are some of the best. It can be tough not to fill up on a side of these fries and a real challenge to leave any room for a burger! Sometimes, the simplest fries are the best. Greenfield’s hot, crispy fries aren’t covered in cheese or truffle oil, but they are perfectly fluffy and delicious. These are the type of fries that always hit the spot and keep you coming back again and again. Amsterdam Falafel and Kabob in Omaha is famous for its curry fries, which are unmatchable. Dusted in curry powder and served Belgian style, these fries are consistently delicious no matter what time of the day you order them.